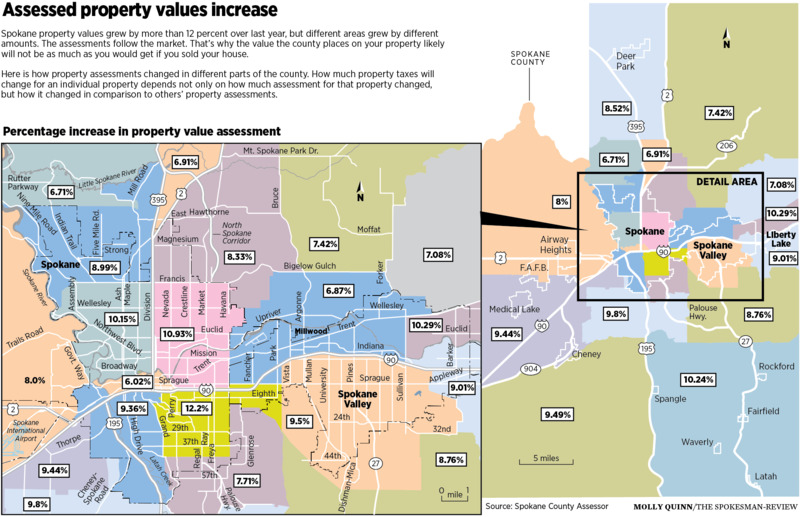 That’s how much Spokane County is worth, according to this year’s property assessments, up $4.1 billion over last year. At $49.7 billion, the record value in property has surprised some homeowners, who have received official postcards in the mail detailing the double-digit increases in their homes’ assessed values. The single family home that jumped the greatest dollar amount from 2017 to 2018 – up $190,850 to more than $1.5 million – is on High Drive on the South Hill. The home was not remodeled and had no new additions, and it still increased in value by more than $500 a day. Another house, just southwest of the city, saw its value jump by 30 percent to nearly $700,000. In other words, it gained $18 an hour, 24 hours a day, 365 days a year. The formula used by county assessors to determine home values is complex, but this year’s jump can be simply understood: our home sales market is bonkers, and it’s driving all home values through the roof. “Values are up. We’re following the real estate market,” said Byron Hodgson, Spokane County’s chief deputy assessor. But some homeowners are befuddled or frustrated by the big jump. Spokane resident Karly Searl, who purchased a home in the Shadle neighborhood last year, said the postcard from the assessor’s office showed that her home value increased $32,000. In 2007, the home was valued at $107,400 and it’s now $139,800, she said. Searl said there wasn’t much communication from the assessor’s office about potential property value increases besides receiving a postcard in the mail. The way the county determines home value is governed by state law, which states that property “must be valued at 100 percent of its true and fair value in money.” That’s generally interpreted as fair market value, and county appraisers use statistical analysis to calculate assessed value, drawing from a number of sources, including upwards of 10,000 comparable home sale prices, what type of house it is and the neighborhood’s character. Hodgson estimated that the assessed values are “six months or a year behind” the market, a recognition of a fast-growing market in which home prices are up, sales are up and competition is fierce for available homes. According to Zillow, the online real estate database company, the median home sales price in June for Spokane was about $200,000. A year ago, that number stood at $173,000, and in June 2014, the median sales prices was $142,000. In all, Spokane home values grew by more than 12 percent over the last year, and Zillow estimates they’ll grow by nearly 9 percent in the coming year. As go home prices, so go assessments. “We’re behind the market because we’re following it,” Hodgson said. But a big jump in assessed value doesn’t mean property taxes will follow suit. Hodgson pointed to 2007, when property assessments increased approximately 15.5 percent for the entire county, but taxes only increased by 1.9 percent. This is because most local taxes seek to raise a certain amount of money, and are not taken as a certain percentage of your home’s worth. It’s not like buying a bag of groceries, when the the total bill is taxed at a particular rate. Instead, property tax rates are based on the taxing district’s budget request, and the total assessed value of the taxing district. In other words, the county assessor sees how much has been requested by the county’s 124 different tax areas, which are created by the overlapping boundaries of school districts, fire districts, library districts, cities and towns. Then, assessors look at the value of the homes within the various tax areas. Some divvying later, property owners are told how much they owe for their share of the pie. One major exception to that rule is Washington state’s school fund. In 2017, the Legislature passed a law to meet a state Supreme Court obligation requiring it to fully fund basic education. Part of the law changed a statewide property levy. Instead of the levy being budget-based, like other property taxes, it went to being rate-based, like that bag of groceries. That means when your property assessment goes up, so will your taxes that pay for basic education. In 2019, for every $1,000 of assessed value, property owners will owe $2.40 for this education levy. In 2020, that rate will rise to $2.70 for every $1,000 of assessed value. So far this year, Spokane County has sent out 208,474 valuation notices, but this doesn’t reflect the total amount of parcels in the county. Property assessed by the state, which includes properties used for telecommunications, railroads, air transportation, power companies and pipelines will be added to the parcel total later, as will new construction and business personal property. In 2017, the county’s parcels accounted for more than $45.6 billion in assessed value, which brought in more than $618 million in taxes to the various jurisdictions. A bulk of the money collected went to schools in 2017, which received more than $360 million of the $618 million collected. City levies drew more than $93 million, and fire districts got $67 million. With assessments nearing $50 billion this year, it’s still unclear how much in taxes the county’s 55 taxing districts will collect. That dollar figure will be known come January. Spokesman-Review reporter Amy Edelen contributed to this report.